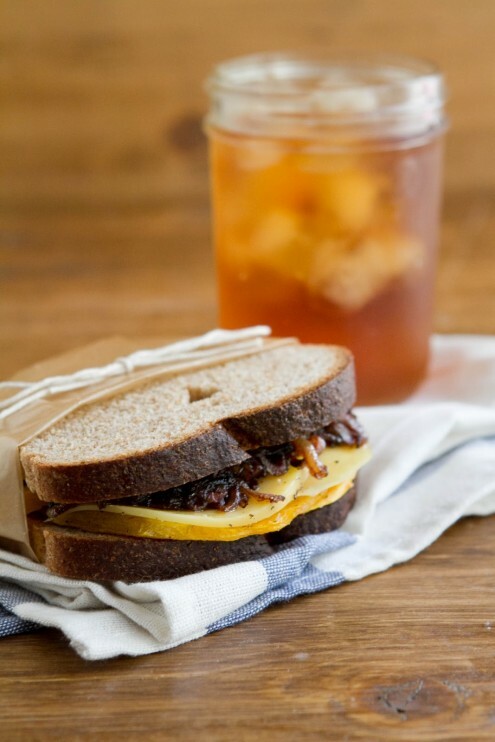 Butternut Squash and Balsamic Onion Sandwich | Naturally. The most dangerous section of the store for me is the checkout lines with all of the magazines. I love looking at the photos and coming up with inspirations from all of the delicious looking recipes. This recipe came from the October issue of Food Magazine from Jeff Mauro (you know- the guy who won the most recent season of Next Food Network Star.) He really did come up with some pretty amazing sandwiches so when I saw this vegetarian grilled cheese sandwich- I knew I had to make it! 1 slice of smoked gouda (or another favorite cheese)- leave off for vegan! 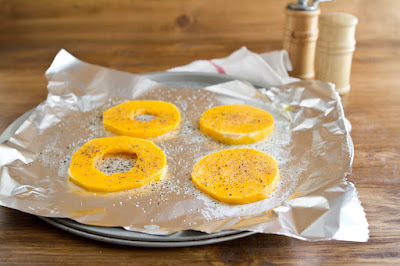 Take slices of butternut and brush with one tablespoon of olive oil. Place on aluminum foil covered baking tray. Sprinkle with salt and pepper. Bake until soft and golden, about 20-25 minutes. Pull from oven and let cool. While the butternut squash is baking, heat over low the remaining olive oil in a skillet. Place sliced onions in skillet and begin to let onions cook- do not stir. Continue to cook onions until they begin to brown, 10-15 minutes. Once onions are cooked, stir in balsamic vinegar and continue to cook until vinegar reduces down, about 5-10 minutes. Once onions and squash are ready, build your sandwich with the squash, onions, and cheese. It is at this point you can either eat the sandwich or you can turn your griddle on and grill the sandwich. Sandwiches are superb! 1 full meal in a wrap…The Blasamic onions I’m sure will give a distinctive taste. i can’t wait to make this and press it in my panini maker!! oh wow, I bet this would be wonderful with goat cheese! Hello, I roasted a butternut squash over the weekend. Most of it went to the freezer but I kept some in the frig to try a recipe or two. So, today, I am wondering if I can use the squash on a sandwich and came across your recipe. It sounded so delicious I made it right away. I didn’t have Gouda cheese so I use a reduced mexican mix but truly I don’t think it needs any. Oh my, this is the bomb. I love the combination of the onions with the squash. This is a keeper. I can’t wait to scroll through your other recipes. I planted 2 (TWO) butternut squash seed and they took over my garden and some of my yard. Got maybe 30 squash which I am sure is 75 pounds or more. Can’t wait to try this sandwich. 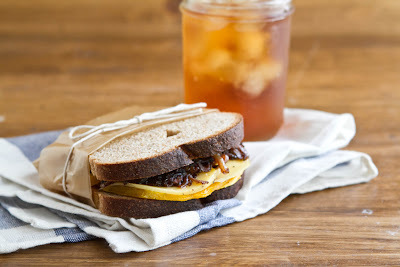 While I truly love butternut squash, caramelized onions makes everything taste better.